"Get the blue cheese. NOW!" 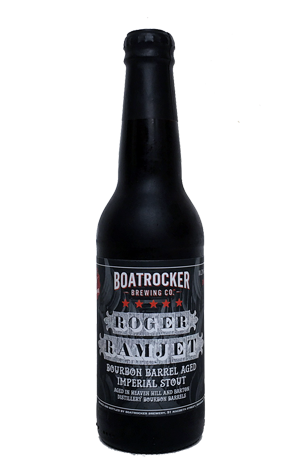 Roger Ramjet Mk II – again aged in barrels from Heaven Hill and Barton Distillery barrels – spent more time on oak and the result is a beer that seems both bigger and more decadent yet more integrated too. There's more juiciness from the barrel's former inhabitants on the nose, wrapped up in rich chocolate fudge, vanilla, dates, coconut and Vietnamese iced coffee, characters that continue through its luxuriant passage across your palate. There's a welcome booziness that's in balance with the other elements in yet another beer to add to the pantheon of classics from the Braeside brewery. NB: It took us a few days to find a gap in our sampling schedule for this and we believe some stores may already be sold out – sorry!